Daystar Switch Panels give you room to easily install up to 5 switches to control the electronic accessories on your Jeep Wrangler. ...command your Jeep from the cabin with Daystar's switch panels! Whether it's light bars or a hydraulic winch, set them off in style with 20 AMP lighted blue, green, orange, or red rocker switches (sold seperately below). These switch panels are Made in the USA and directly replace the stock upper or lower dash panels on several year models of the Jeep Wrangler. 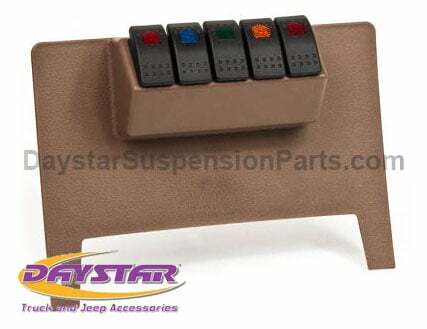 Simply remove and replace this DIY friendly part and command your Jeep from the cabin with Daystar's switch panels! Dash panels are also available for keeping track of anything you don't want to just throw in the passenger seat of your truck or SUV.